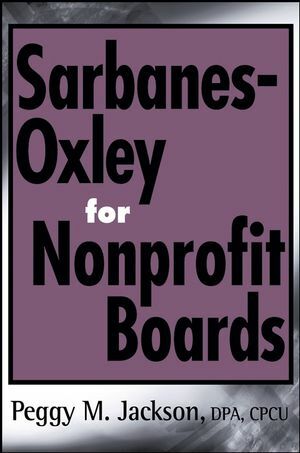 The Sarbanes-Oxley (SOX) bar has been raised-is your nonprofit board up to the task? Nonprofit boards are in a fishbowl of scrutiny much like their private sector counterparts. With recent media focus on investigations of false charities, and more disturbingly, of household-name nonprofits that have abused donor trust by misdirecting donations, the heat is on the nonprofit board to rehabilitate its organizational profile. Encouraging boards to reclaim their role as the ultimate authority within their nonprofit, nationally recognized nonprofit expert Dr. Peggy Jackson supplies tips for leveraging the power and value of SOX requirements within the nonprofit organization. Containing sample documents, forms, and checklists to introduce best practices into any nonprofit organization, this complete guide is a practical, hands-on tool for equipping your nonprofit's board toward a higher quality of control. 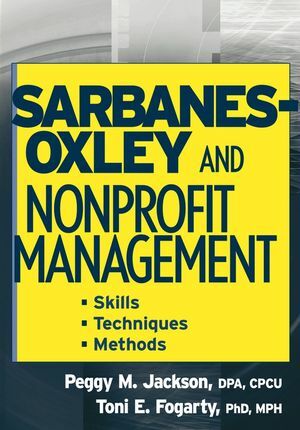 Helping your nonprofit board understand and implement SOX requirements, Sarbanes-Oxley for Nonprofit Boards will be indispensable as a guide and will reinforce your nonprofit's financial structure and reputation. PEGGY M. JACKSON, DPA, CPCU, is a consultant and nationally recognized lecturer in risk management, business continuity planning, and Sarbanes-Oxley compliance. She is a principal with Adjunct LLC and a founding partner of the Fogarty, Jackson & Associates Consulting Group in San Francisco, California. Dr. Jackson has coauthored several books published by Wiley, including Managing Risk in Nonprofit Organizations, Sarbanes-Oxley for Nonprofits, and Sarbanes-Oxley and Nonprofit Management: Skills, Techniques, Methods. She divides her time and consulting practice between her homes in the San Francisco Bay Area and the Washington DC metro area. Chapter 1. History and Legislative Background of the Sarbanes-Oxley Act of 2002 and State Nonprofit Accountability Legislation. Chapter 2. Moving Nonprofit Governance into the Twenty-First Century. Chapter 3. Leveraging Sarbanes-Oxley Requirements and Best Practices to Move our Board to a Higher Level of Performance. Chapter 4. SOX as a Cure for the "Leave Your Brains at the Door" Syndrome. Chapter 5. Moving the Board Forward: Intervention Techniques. Chapter 6. Start at the Beginning. Chapter 7. Establishing a Platinum Standard for Governance. Chapter 8. SOX and the really Small Nonprofit Board. Appendix A. Letter from Senator Grassley to the Acting Chair of the American University Board of Trustees. Appendix B. Whistleblower Protection Policy. Appendix C. Risk Management Plan and Business Continuity Plan. Appendix E. Review of Internal Controls Report and Recommendations. Appendix F. Board of Directors-Governance Profile and Performance Expectations. Appendix H. Code of Ethics for Board and Senior Management. AUTHOR PLATFORM: Peggy M. Jackson is a published author who routinely (10-15 times per year) speaks at seminars and conferences on risk management, business continuity planning, and Sarbanes-Oxley compliance for nonprofits and private companies. TIPS AND TECHNIQUES: Includes forms and checklists to accompany the discussion in the text. 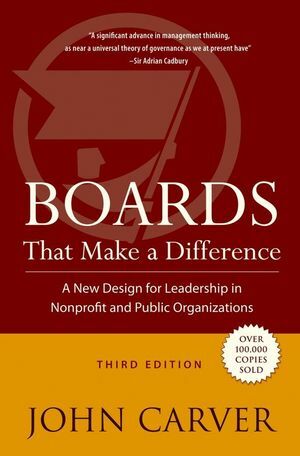 Because the author is an educator and consultant to the nonprofit world, the focus of the overall presentation is very user-friendly to nonprofit boards of all sizes. 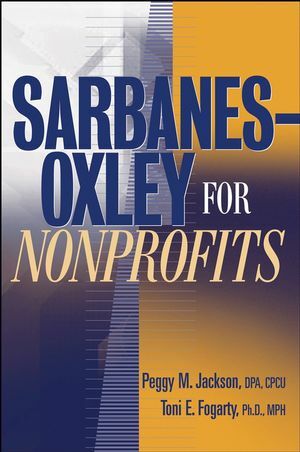 BEST PRACTICES: The author provides a summary of the most important aspects of Sarbanes-Oxley for nonprofit boards and offers recommendations for best practices.